It was my pleasure to meet the creative and articulate Rob Bowker in the flesh. 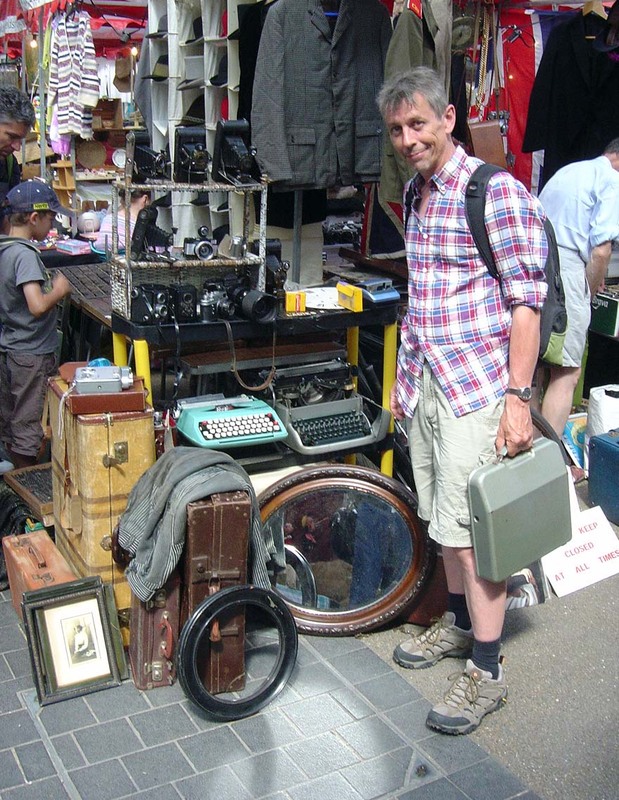 After checking out the vintage shops of Shoreditch we headed for antiques day at Spitalfields Market. 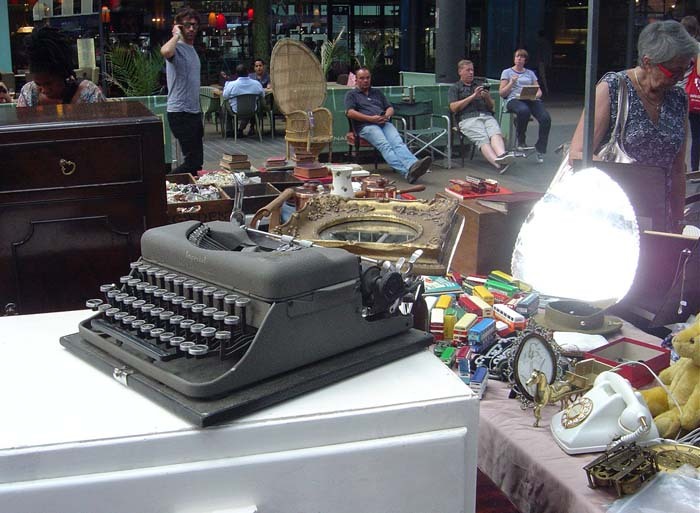 This booth included quite a few typewriters. The seller told us he finds them in many places and they go to many buyers, young and old, for £35-100 apiece. Today he had a Smith-Corona Corsair, a Remington Super-Riter, an Empire Aristocrat, an Olympia Splendid, and a Tippa S.
(by appointment to HRH the late King George VI). Model 2? 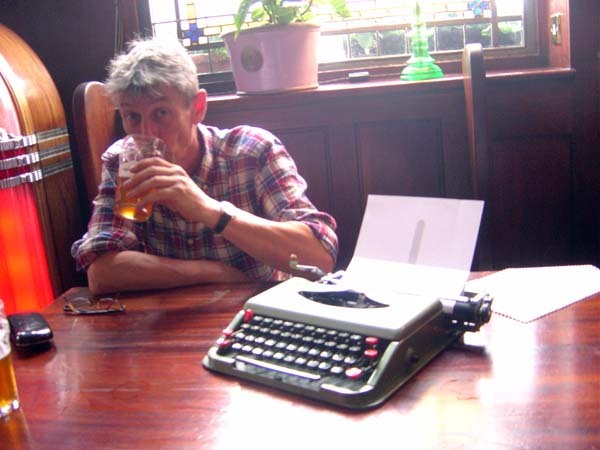 Then it was time for a pub and a couple of pints of Timothy Taylor's Landlord. We each brought a shiny green ultraportable. Rob's Antares Parva has the nicest, glossiest finish I've ever seen on this model, and it can type a pilcrow (¶)! hand at the Kolibri. 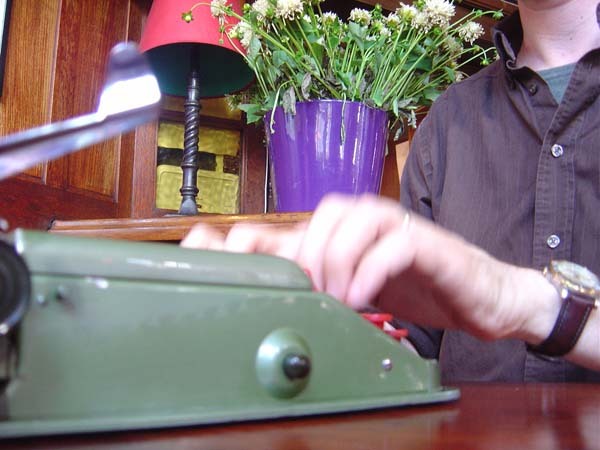 He was a good typist, too! And here's the three-author text I carried away as a souvenir. Forgive the incoherence of my notes on Rob's quite coherent spoken thoughts. Rob, thanks for great conversation and a good time. I look forward to our next meeting. Ah! So, is there a beer review coming forth of that glass he's drinking? Looks like some great fun has been had by the two of you. And that Antares is quite a little machine! And I fully endorse his observations. 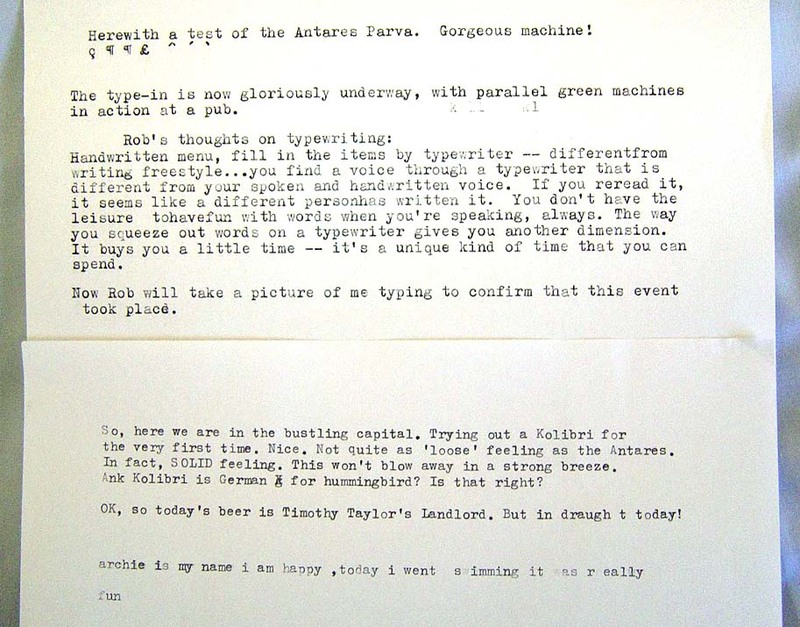 It appears from the volume of writing done that there was more talking and drinking going on that typing, but clearly the magic of typewriters sucked in a new convert in Archie and perhaps one of the typewriters you guys spotted will get adopted in the coming days by a budding young typist who got his first taste of a Kolibri in a pub by a visiting Yank. What a great trip! I bet the Kolibri gets a lot of attention wherever you go. Have you received any comments from passersby about the machine? What are their reactions when they see you (and hear you!) typing? I agree, other people didn't interfere or pay much attention -- maybe that's the admirable British quality of letting eccentrics pursue their harmless eccentricities. 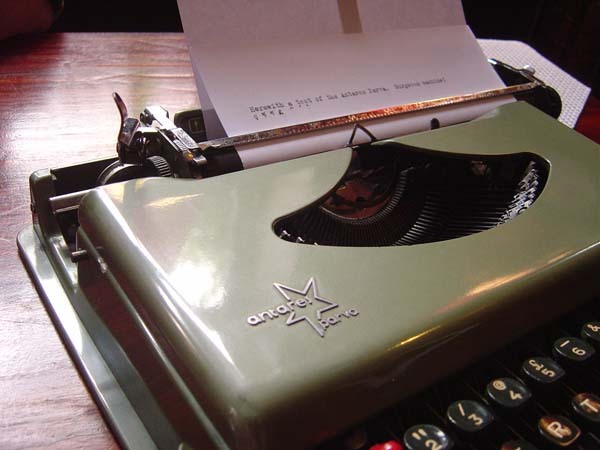 When Archie was willing to show his curiosity, his father chimed in with some smiling recollections of typewriting. By the way, I learned today that the paragraph symbol has a name- "pilcrow". Something I have never known before! I shall be working that term into my conversations in the next few days. Archie, huh? Instantly made me think of the old "Archie & Mehitabel" poetry. In fact I thought it was a reference to it until I realized it was the lad's name. Just realized the spelling of "Archy" is different. 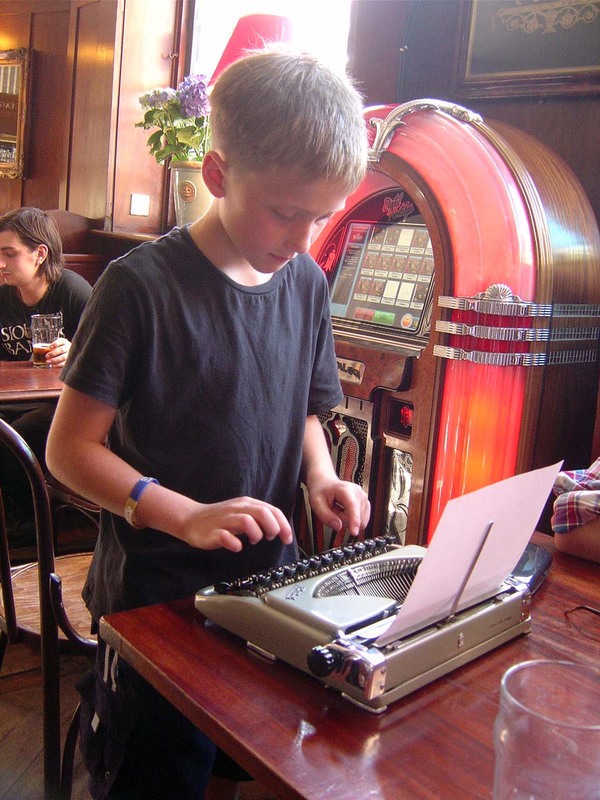 Still, perhaps there is a typewriter and an alley cat in the lad's future. Ha, you're right! That hadn't occurred to me. Or, of course, maybe he was writing a tribute to e. e. cummings. It is good to have a picture of Rob. It appears you both had a nice time at the type-in. I, like Peter, have learned something new today: the name for the paragraph symbol. If I ever knew it from the print shop from decades ago I forgot it. What fun! 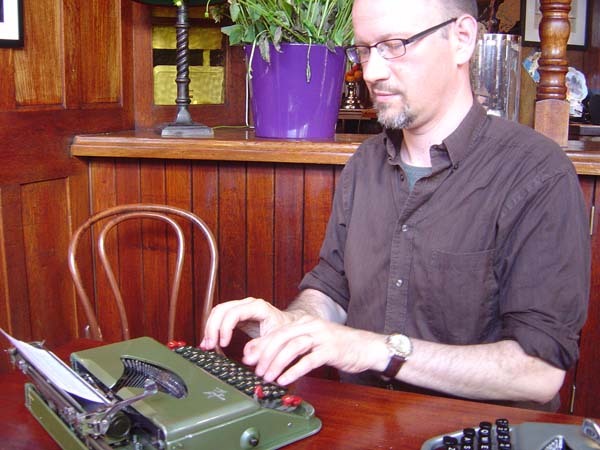 Glad the type-in went really well and it's great to see a young volunteer typist. Thanks to Rob, I'm taking a second look at the Antares Parva, very nice. 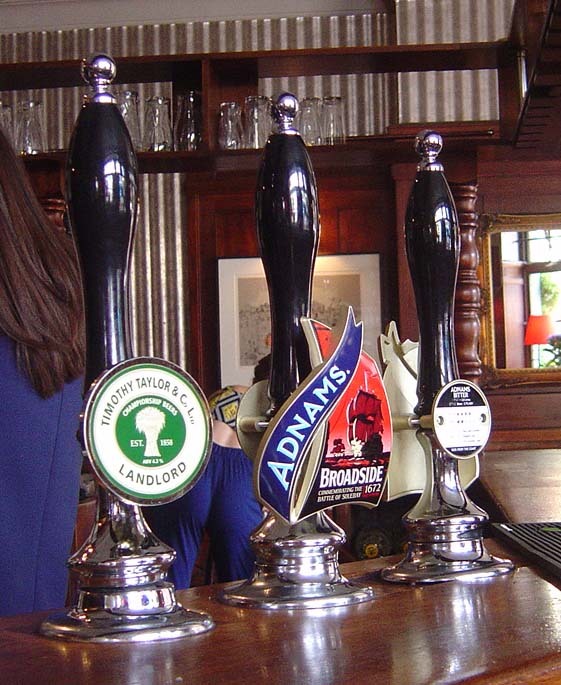 Very enjoyable tale, which brought to live the convivial atmosphere of a British pub. We are starting to figure out how to pull that off over here in the States, but it is slow going lighting up and opening up the bars. That's just what I was telling Rob -- there's something welcoming about a good English pub that is imitated by some US bars but rarely with success. 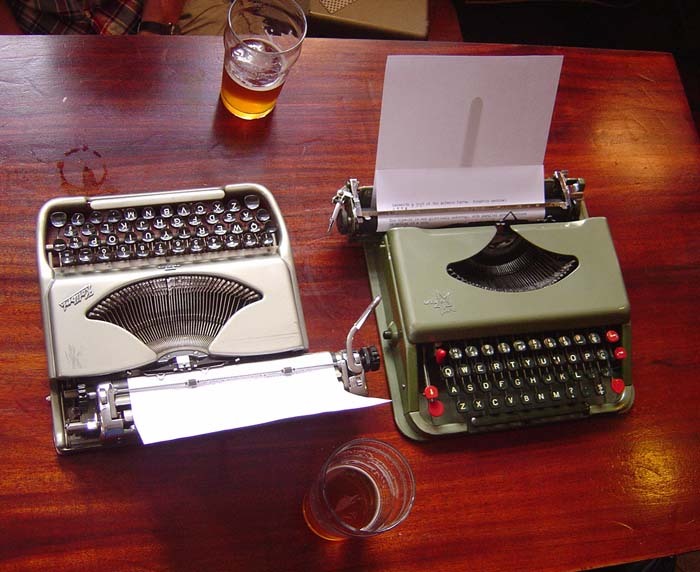 Beautiful typewriters! Love those ultra portables. I've yet to find anything like that in Kentucky.